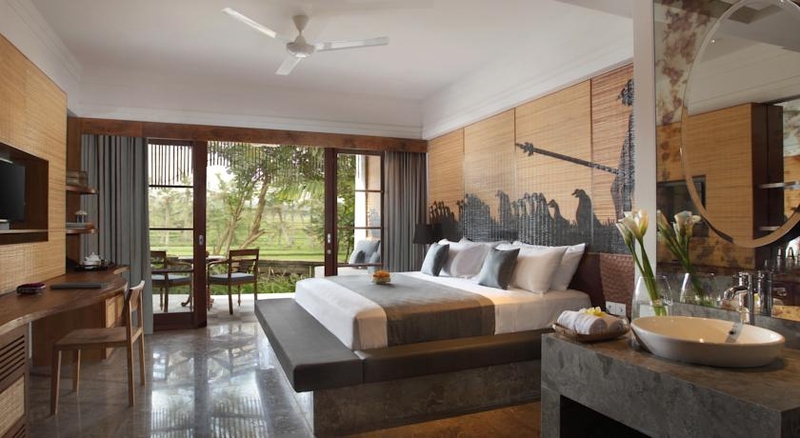 The resort was designed to reflect Bali as an artistic destination and meet the needs of international travellers. Set in the lush tropical environment of Ubud in Central Bali, it offers warm hospitality and a distinct sense of belonging to the island of Bali. The main pool at Alaya Ubud is elongated with shapely curves mirroring the sloping contours of the surrounding landscape. A bamboo bridge crosses the centre of the pool and the whole outer area is covered in natural stone. A traditional Balinese pavilion at the base of Alaya Ubud's charming landscape overlooks a small flowing river with native flora in this relaxing area. This multi-purpose space lends itself to an array of different activities including sessions of yoga or meditation. The pavilion is available for private celebrations of the heart such as a wedding ceremony or candlelight dinner away from the main buildings.